Newly revealed text messages between former FBI agent Peter Strzok and former FBI attorney Lisa Page reveal that Strzok wanted to use CNN’s report on the infamous “Steele Dossier” to justify interviewing people in the Trump-Russia investigation, reports CNN. “Sitting with Bill watching CNN. A TON more out,” Strzok texted to Page on Jan. 10, 2017, following CNN’s report. “Hey let me know when you can talk. 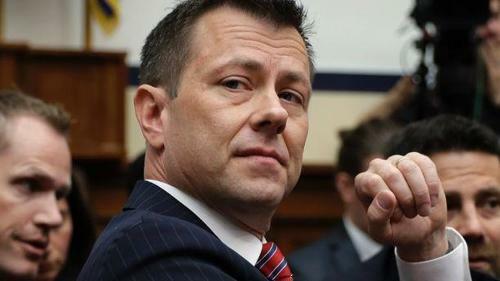 We’re discussing whether, now that this is out, we use it as a pretext to go interview some people,” Strzok continued. Recall that CNN used the (leaked) fact that former FBI Director James Comey had briefed then-President-Elect Donald Trump on a two-page summary of the Steele Dossier to justify printing their January report. This is a troubling development in light of a May report that the FBI knew that CNN was “close to going forward” with the Steele Dossier story, and that “The trigger for them is they know the material was discussed,” clearly indicating active communications between CNN and the FBI. In short, knowledge of the Comey-Trump briefing was leaked to CNN, CNN printed the story, Strzok wanted to use it as a pretext to interview people in the Trump-Russia investigation, and weeks later George Papadopoulos became ensnared in their investigation. And when one considers that we learned of an FBI “media leak strategy” this week, it suggests pervasive collusion between Obama-era intelligence agencies and the MSM to defeat, and then smear Donald Trump after he had won the election. A review of the documents suggests that the FBI and DOJ coordinated efforts to get information to the press that would potentially be “harmful to President Trump’s administration.” Those leaks pertained to information regarding the Foreign Intelligence Surveillance Court warrant used to spy on short-term campaign volunteer Carter Page. Recall that Strzok’s boss, former FBI Deputy Director Andrew McCabe, was fired for authorizing self-serving leaks to the press. Also recall that text messages released in January reveal that Lisa Page was on the phone with Washington Post reporter Devlin Barrett, then with the New York Times, when the reopening of the Clinton Foundation investigation hit the news cycle – just one example in a series of text messages matching up with MSM reports relying on leaked information, as reported by the Conservative Treehouse. Going back to the internal FBI emails revealed in May by Sen. Ron Johnson (R-WI), we find that McCabe had advance knowledge of CNN’s plans to publish the Steele Dossier report. In an email to top FBI officials with the subject “Flood is coming,” McCabe wrote: “CNN is close to going forward with the sensitive story … The trigger for them is they know the material was discussed in the brief and presented in an attachment.” McCabe does not reveal how he knew CNN’s “trigger” was Comey’s briefing to Trump. “Just as an FYI, and as expected,” McCabe wrote, “it seems CNN is close to running a story about the sensitive reporting.” Again, how McCabe knew this is unclear and begs investigation. “Did you or your subordinates leak that?” Baier asked. “Did you ever try to find out?” Baier asked. “Who leaked an unclassified public document?” Comey said, even though Baier’s question was about leaking details of a briefing of the incoming president, not the dossier. “No,” Comey said.